Einstein is best known for his work on the theory of relativity, an idea so important that it underpins the majority of modern physics. Relativity explains what happens to objects as they travel at speed all the way up to the speed of light. Relativity also produces the equation E=mc2, which links energy and mass. This equation is vital in the production of nuclear weapons. 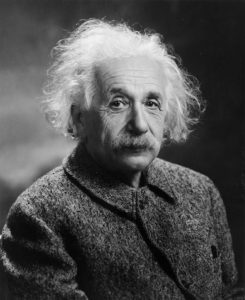 Many of Einstein’s theories and discoveries stemmed from his understanding that the laws and theories outlined by Newton were no longer satisfactory to explain ideas in science that had arisen since Newton’s death. For example, that classical mechanics as described by Newton could not explain phenomena such as electromagnetic fields. Einstein took what was already known and developed those ideas further than anyone could have imagined. He filled in many gaps in our knowledge and drove humanity´s understanding of the universe at a rapid rate. Our knowledge of the universe today is based on the theories that Einstein developed. It is difficult to summarise Einstein’s work in a few short passages, so I will not even attempt to do so, but the next time you use a GPS system, remember that it was Einstein’s work on relativity that made this possible. His impact on everyday life is monumental. In fact, there is barely a development in modern physics that is not in some way underpinned by Einstein’s work. Want to learn more about science? Then sign up for our great science courses.